Made from solid wood for a long busy life in a bustling bar or cafe. Easy to maintain and store away after hours. Features include arm rest and feature designer back. Molded seat for comfort. 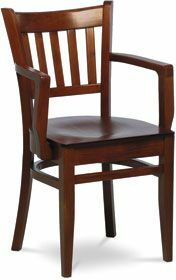 Commercial standard solid wood dining chair with comfortable, curved molded seat. Manufactured to a very high standard and built for use in a number of different commercial applications.